The heart is a pear shaped, muscular organ in vertebrates, responsible for pumping blood through the blood vessels by repeated, rhythmic contractions The term cardiac (as in cardiology) means "related to the heart" and comes from the Greek. The heart is composed of cardiac muscle, an involuntary muscle tissue which is found only within this organ. In the human body, the heart is normally situated to the left of the middle of the thorax, underneath the breastbone (see diagrams). The heart is usually felt to be on the left side because the left heart (left ventricle) is stronger (it pumps to all body parts). The left lung is smaller than the right lung because the heart occupies more of the left hemithorax. The heart is enclosed by a sac known as the pericardium and is surrounded by the lungs. 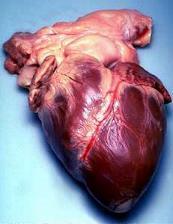 The pericardium is a double membrane structure containing a serous fluid to reduce friction during heart contractions. The mediastinum, a subdivision of the thoracic cavity, is the name of the heart cavity. The apex is the blunt point situated in an inferior (pointing down and left) direction. A stethoscope can be placed directly over the apex so that the beats can be counted. This physical location is between the sixth and seventh rib, just to the left of the sternum . In normal adults, the mass of the heart is 250-350 g (9-12 oz), or about three fourths the size of a clenched fist, but extremely diseased hearts can be up to 1000 g (2 lb) in mass due to hypertrophy. It consists of four chambers, the two upper atria (singular: atrium ) and the two lower ventricles. On the left is a picture of a fresh human heart which was removed from a 64-year-old British male. The function of the right side of the heart (see right heart) is to collect deoxygenated blood, in the right atrium, from the body and pump it, via the right ventricle, into the lungs (pulmonary circulation) so that carbon dioxide can be dropped off and oxygen picked up (gas exchange). This happens through a passive process called diffusion. The left side (see left heart) collects oxygenated blood from the lungs into the left atrium. From the left atrium the blood moves to the left ventricle which pumps it out to the body. 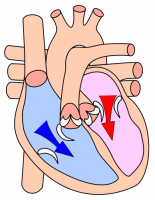 On both sides, the lower ventricles are thicker and stronger than the upper atria. The muscle wall surrounding the left ventricle is thicker than the wall surrounding the right ventricle due to the higher force needed to pump the blood through the systemic circulation. The electrical signals pass through the heart from the SAN, through the atria, to the AVN and then to the vetricales via the Purkinje fibres. Animations of the electrical pulses and the ECG generated. If the SAN is diseased or inherits a malfunction then the heart may develop rapid (tachycardia), slow (bradycardia), or both rapid and slow rhythms (arrhythmia). Treatment may involve drugs and/or a cardiac pacemaker. Ventricular fibrillation: Dangerous and rapid arrhythmia of the ventricle. The ECG shows a "bizarre, irregular, random waveform; no clearly identifiable QRS complexes or P waves." 450 px ECG showing ventricular fibrillation. Heart rate is a term used to describe the frequency of the cardiac cycle. It is considered one of the four vital signs. Usually it is calculated as the number of contractions (heart beats) of the heart in one minute and expressed as "beats per minute" (bpm). When resting, the adult human heart beats at about 70 bpm (males) and 75 bpm (females), but this rate varies among people. However, the reference range is normally between 60 bpm (if less termed bradycardia) and 100 bpm (if greater, termed tachycardia). Resting heart rates can be significantly lower in athletes. The pulse is the most straightforward way of measuring the heart rate, but it can be deceptive when some heart beats do not have much cardiac output. In these cases (as happens in some arrhythmias), the heart rate may be considerably higher than the pulse rate. Auscultation is also a method of heart rate measurement. The heart is controlled by the autonomic nervous system and circulating adrenaline. The autonomic nervous system has two divisions: The sympathetic nervous system ('fight or flight' response) stimulates cardiac ouptut by acting on the SAN, the cardiac muscle and the AVN. The parasympathetic nervous system ('rest and digest' response) has the opposite effect. Blood pressure is detected by baroreceptors in the carotid arteries. Chemoreceptors in the medulla oblongata detect changes in pH and carbon dioxide levels. Decreased blood pressure, pH or increased CO2 levels cause stimulation of the heart via the sympathetic nervous system. Although chemoreceptors in the aorta and carotid arteries detect oxygen levels, the response is counterintuitive. Low oxygen levels cause the heart rate to decrease, which protects the heart muscle from the effects of anaerobic respiration. Tachycardia refers to a rapid beating of the heart. By convention the term refers to heart rates greater than 100 beats per minute in the adult patient. Tachycardia may be a perfectly normal physiological response to stress. However, depending on the mechanism of the tachycardia and the health status of the patient, tachycardia may be harmful, and require medical treatment. In extreme cases, tachycardia can be life threatening. Tachycardia can be harmful in two ways. First, when the heart beats too rapidly, it may perform inefficiently. Second, the faster the heart beats, the more oxygen and nutrients the heart requires. This may leave patients feeling out of breath. This can be especially problematic for patients suffering from ischemic heart disease. This can happen in response to a decrease in blood volume (through dehydration or bleeding), or an unexpected change in blood flow. The most common cause of the latter is orthostatic hypotension (also called postural hypotension), a sudden drop of blood pressure that occurs with a change in body position (e.g., going from lying down to standing up). Fever and infection leading to sepsis are also common causes of tachycardia, primarily due to increase in metabolic demands and compensatory increase in heart rate. An increase in sympathetic nervous system stimulation causes the heart rate to increase, both by the direct action of sympathetic nerve fibres on the heart and by causing the endocrine system to release hormones such as epinephrine (adrenaline), which have a similar effect. Increased sympathetic stimulation is usually due to physical or psychological stress (the so-called "fight or flight" response), but can also be induced by stimulant]s such as amphetamines. The most common type of tachycardia is sinus tachycardia, which is the body's normal reaction to stress, including fever, dehydration, or blood loss (shock). In the absence of heart disease, it tends to have a narrow QRS complex on the ECG. Treatment is generally directed at identifying the underlying cause. Bradycardia is defined as a heart rate less than 60 beats per minute although it is seldom symptomatic until below 50 bpm. Trained athletes tend to have slow resting heart rates, and resting bradycardia in athletes should not be considered abnormal if the individual has no symptoms associated with it. Again, this number can vary as smaller people and children have faster heart rates than adults. A person's pulse is the throbbing of their arteries as an effect of the heartbeat. It can be felt at the [neck, at the wrist and other places. Pressure waves move through the blood vessels, which are pliable; these waves are not caused by the forward movement of the blood. When the heart contracts, blood is ejected into the aorta and the aorta stretches. At this point the wave of distention (pulse wave) is pronounced but relatively slow-moving (3 to 6 m/s). As it travels towards the peripheral blood vessels, it gradually diminishes and becomes faster. In the large arterial branches, its velocity is 7 to 10 m/s; in the small arteries, it is 15 to 35 m/s. The pressure pulse is transmitted 15 or more times more rapidly than the blood flow. The term pulse is also used, although incorrectly, to denote the frequency of the heart beat, usually measured in beats per minute. In most people, the pulse is an accurate measure of heart rate. Under certain circumstances, including arrhythmias, some of the heart beats are ineffective and the aorta is not stretched enough to create a palpable pressure wave. The pulse is irregular and the heart rate can be (much) higher than the pulse rate. In this case, the heart rate should be determined by auscultation of the heart apex, in which case it is not the pulse. The pulse deficit (difference between heart beats and pulsations at the periphery) should be determined by simultaneous palpation at the radial artery and auscultation at the heart apex. A normal pulse rate for a healthy adult, while resting, can range from 60 to 100 beats per minute (BPM). During sleep, this can drop to as low as 40 BPM; during strenuous exercise, it can rise as high as 200–220 BPM. Generally, pulse rates are higher in younger persons. A resting heart rate for an infant is as high as or higher than an adult's pulse rate during strenuous exercise. Pulses are manually palpated with fingers or thumb. When palpating the carotid artery, the femoral artery or the brachial artery, the thumb may be used. However, the thumb has its own pulse which can interfere with detecting the patient's pulse at other points, where two or three fingers should be used. Fingers or thumb must be placed near an artery and pressed gently against a firm structure, usually a bone, in order to feel the pulse. An alternative way of finding the pulse rate is by palpating or listening to the heartbeat. This is most commonly done with the examiner's palm or a through a stethoscope. Before the invention of the stethoscope examiners would press their ear directly to the chest. carotid pulse - located in the neck (carotid artery). The carotid artery should be palpated gently. Stimulating its baroreceptors with vigorous palpitation can provoke severe bradycardia or even stop the heart in some sensitive persons. Also, a person's two carotid arteries should not be palpated at the same time, to avoid a risk of fainting or brain ischaemia. popliteal pulse - located behind the knee in the popliteal fossa, found by holding the bent knee. The patient bends the knee at approximately 120°, and the physician holds it in both hands to find the popliteal artery in the pit behind the knee. tibialis posterior pulse - located in the back of the ankle behind the medial malleolus (posterior tibial artery). The ease of palpability of a pulse is dictated by the patient's blood pressure. If his or her systolic blood pressure is below 90 mmHg, the radial pulse will not be palpable. Below 80 mmHg, the brachial pulse will not be palpable. Below 60 mmHg, the carotid pulse will not be palpable. Since systolic blood pressure rarely drops that low, the lack of a carotid pulse usually indicates death. It is not unheard of, however, for patients with certain injuries, illnesses or other medical problems to be conscious and aware with no palpable pulse. The lung is the essential respiration organ in air-breathing vertebrates. Its principal function is to transport oxygen from the atmosphere into the bloodstream, and to excrete carbon dioxide from the bloodstream into the atmosphere. This exchange of gases is accomplished in the mosaic of specialised cells that form millions of tiny, exceptionally thin-walled air sacs called alveoli. The lungs also have nonrespiratory functions. Energy production from aerobic respiration requires oxygen and produces carbon dioxide as a by-product, creating a need for an efficient means of oxygen delivery to cells and excretion of carbon dioxide from cells. In air-breathing vertebrates, respiration occurs in a series of steps. Air is brought into the animal via the airways — this consists of the nose; the pharynx; the larynx; the trachea (also called the windpipe); the bronchi and bronchioles; and the terminal branches of the respiratory tree. The lungs are a rich lattice of alveoli, which provide an enormous surface area for gas exchange. A network of fine capillaries allows transport of blood over the surface of alveoli. Oxygen from the air inside the alveoli diffuses into the bloodstream, and carbon dioxide diffuses from the blood to the alveoli, both across thin alveolar membranes. The drawing and expulsion of air is driven by muscular action; a complicated musculoskeletal system is used. A large muscle, the diaphragm (in addition to the internal intercostal muscles), drive ventilation by periodically altering the intra-thoracic volume and pressure; by increasing volume and thus decreasing pressure, air flows into the airways down a pressure gradient, and by reducing volume and increasing pressure, the reverse occurs. During normal breathing, expiration is passive and no muscles are contracted (the diaphragm relaxes). Another name for this inspiration and expulsion of air is ventilation. The lungs of mammals have a spongy texture and are honeycombed with epithelium having a much larger surface area in total than the outer surface area of the lung itself. In humans, it is the two main bronchi (produced by the bifurcation of the trachea) that enter the roots of the lungs. The bronchi continue to divide within the lung, and after multiple divisions, give rise to bronchioles. The bronchial tree continues branching until it reaches the level of terminal bronchioles, which lead to alveolar sacks. Alveolar sacs are made up of clusters of alveoli, like individual grapes within a bunch. The individual alveoli are tightly wrapped in blood vessels, and it is here that gas exchange actually occurs. Deoxygenated blood from the heart is pumped through the pulmonary artery to the lungs, where oxygen diffuses into blood and is exchanged for carbon dioxide in the haemoglobin of the erythrocytes (red blood cells). The oxygen-rich blood returns to the heart via the pulmonary veins to be pumped back into systemic circulation. Human lungs are located in two cavities on either side of the heart. Though similar in appearance, the two are not identical. Both are separated into lobes, with three lobes on the right and two on the left. The lobes are further divided into lobules, hexagonal divisions of the lungs that are the smallest subdivision visible to the naked eye. The connective tissue that divides lobules is often blackened in smokers and city dwellers. The medial border of the right lung is nearly vertical, while the left lung contains a cardiac notch. The cardiac notch is a concave impression molded to accommodate the shape of the heart. Lungs are to a certain extent 'overbuilt' and have a tremendous reserve volume as compared to the oxygen exchange requirements when at rest. This is the reason that individuals can smoke for years without having a noticeable decrease in lung function while still or moving slowly; in situations like these only a small portion of the lungs are actually perfused with blood for gas exchange. As oxygen requirements increase due to exercise, a greater volume of the lungs is perfused, allowing the body to match its CO2/O2 exchange requirements. A person's vital capacity can be measured by a spirometer which can be a wet or regular spirometer (spirometry). In combination with other physiological measurements, the vital capacity can help make a diagnosis of underlying lung disease. Vital capacity is the maximum amount of air a person can expel from the lungs after first filling the lungs to their maximum extent and then expiring to the maximum extent (about 4600 milliters). It equals the inspiratory reserve volume plus the tidal volume plus the expiratory reserve volume. Breathing transports oxygen into the body and carbon dioxide out of the body. Aerobic organisms require oxygen to create energy via respiration, in the form of energy-rich molecules such as glucose. The medical term for normal relaxed breathing is eupnoea. Breathing in, or inhaling, is usually an active movement, with the contraction of the diaphragm muscles needed. At rest, breathing out, or exhaling, is normally a passive process powered by the elastic recoil of the chest, similar to a deflating balloon. Breathing is only part of the process of delivering oxygen to where it is needed in the body. The process of gas exchange occurs in the alveoli by passive diffusion of gasses between the alveolar gas and the blood passing by in the lung capillaries. Once in the blood, the heart powers the flow dissolved gasses around the body in the circulation. As well as carbon dioxide, breathing also results in loss of water from the body. Exhaled air has a relative humidity of 100% because of water diffusing across the moist surface of breathing passages and alveoli. Unconsciously, breathing is controlled by specialised centres in the brainstem, which automatically regulate the rate and depth of breathing depending on the body’s needs at any time. When carbon dioxide levels increase in the blood, it reacts with the water in blood, producing carbonic acid. The drop in the blood's pH will then cause the medulla oblongata signalling centre in brain to send nerve impulses to the diaphragm and the intercostal muscles, increasing the rate of breathing. While exercising, the level of carbon dioxide in the blood increases due to increased cellular respiration by the muscles, and so breathing rate increases. During rest, the level of carbon dioxide is lower, so breathing rate is lower. This ensures an appropriate amount of oxygen is delivered to the muscles and other organs. It is important to reiterate that it is the buildup of carbon dioxide making the blood acidic that elicits the desperation for a breath much more than lack of oxygen. Rarely, individuals with chronic lung disease may adapt to high CO2 levels in their blood by regulating their breathing according to O2 levels. Hyperventilating causes a drop in CO2 below normal levels, lowering blood acidity to trick the brain into thinking it has more oxygen than is actually present. Humans typically breathe between 12 and 20 times per minute. The air we inhale is roughly 21% oxygen (% by volume). Not all of the oxygen breathed in is converted into carbon dioxide; around 13% of what we breathe out is still oxygen. This is what makes resuscitation possible. Also our reliance on this relatively small amount of oxygen can cause overactivity or euphoria in pure or oxygen rich environments. The process of gas exchange occurs in the alveoli by passive diffusion of gasses between the alveolar gas and the blood passing by in the lung capillaries. Once in the blood, the heart powers the flow dissolved gasses around the body in the circulation. ↑ The American Heritage Stedman's Medical Dictionary. "KMLE Medical Dictionary Definition of heart". http://www.kmle.com/search.php?Search=heart. .
↑ The American Heritage Stedman's Medical Dictionary. "KMLE Medical Dictionary Definition of cardiac". http://www.kmle.com/search.php?Search=cardiac. ↑ The American Heritage Stedman's Medical Dictionary. "KMLE Medical Dictionary Definition of pneumo-". http://www.kmle.com/search.php?Search=pneumo-. ↑ The American Heritage Stedman's Medical Dictionary. "KMLE Medical Dictionary Definition of pulmo-". http://www.kmle.com/search.php?Search=pulmo. This page was last edited on 23 November 2018, at 05:30.